Burchell Gordon, Brand Specialist in the Marketing and Brand Management department, eats, breathes, and sleeps fashion. It is no wonder that by the time he was 24 years old, he had already established a successful clothing line named ‘Bromio by Burch’. “I became obsessed with fashion while at Ardenne High,” he declared. “It all started with me coordinating colours and outfits to make fashion statements and creating a certain mood with what I wear,” he said. His signature brand is represented by a lion’s head etched in the name, Bromio. The image, he explained, has much sentimental value to him as it was the last picture he received from his older sister who passed away less than a week later. He disclosed that the name, ‘Bromio’, was coined from a Greek mythological character, which means ‘roar’ or ‘buzz’, and ‘Burch’ a shortening of his name. “I chose the name because of the significance of its meaning. I want to create a stir in the fashion industry by giving people an avenue to express their own idea of style in a personalised yet trendy manner,” he pointed out. 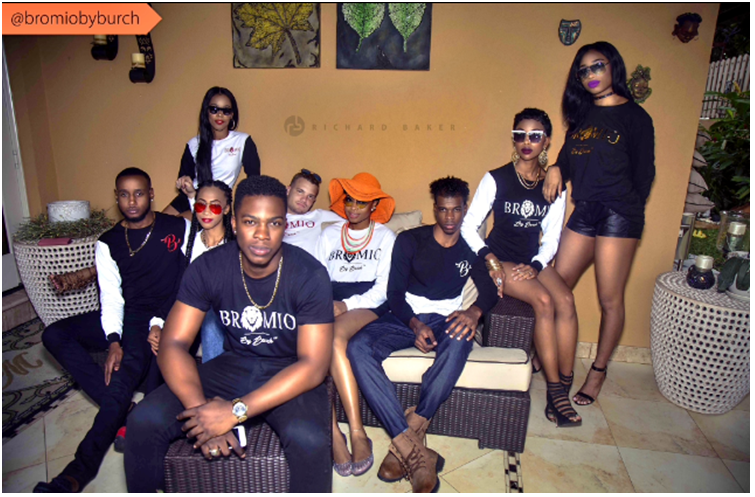 Bromio by Burch supplies a wide array of stylish and appealing apparel, including ambassador t-shirts, custom-made clothing and avant-garde fashion for males and females. In addition, he supplies collectors’ pieces, including button-down shirts, shorts, pants and blouses. Clients can also access altering services and style consultation. “The ambassador t-shirts are the top sellers. All my custom designs are unique in that they are never duplicated,” he emphasised, adding that he creates all the designs and employs persons to construct the garments and market them. Burchell is pleased with the steadily growing clientele which have included LIME (now FLOW), artistes and television personalities. He also pointed out that the brand was a sponsor of the Jamaica Gleaner’s “I am Not a Chef” web series in 2015 by providing customised aprons, chef hats and oxford shirts for the show. Tiffany Lee, HR Business Associate in the Group Human Resource Development department, is a satisfied repeat client. “I purchased two pieces and was impressed with the quality. The garments are affordable and are made from high quality cotton. I have washed them several times and they are still in excellent condition. I also like the logo. Overall, I would give the clothing a rating of five out of five,” she declared. Outside of fashion, Burchell is a television personality and has been host of TVJ School’s Challenge Quiz Access Show since 2013. A staunch socialite, he enjoys mingles and parties, as well as reading motivational books. Recently, he established Burgundy Management Services, a registered company, which recruits talents for TV commercials, modeling and promotions. Explore BromioByBurch clothing line on Facebook and Instagram.